As mentioned above, the most 'basic' F-150 SVT Rapor has everything you need to enjoy on-road and off-road driving. As you can see from the key standard options below, Ford did a great job including all the essentials in the standard Raptor. Engine: It comes standard with a 6.2L engine, 4.10 Electronic Locking Rear Axle, 6 speed Automatic, and the exciting new SelectShift. Electronics: All the electronics you would expect: power locks, keyless entry, power windows, illuminated entry, AM/FM Stereo, and Sirius Satelitte radio. It also has other standard options that you may not have expected, such as SYNC for your cell phone and other bluetooth devices, keypad lock, and cruise control. Features: Also standard is the trailer tow package with class IV hitch receiver, 7-pin wiring harness, upgraded radiator, auxiliary transmission oil cooler, steel plate protection for off-roading, tubular running boards, Electronic Shift-on-the-fly, and Hill Descent Control. This adds more power adjustments to the front seats, driver memory seat, dual-zone temperature control, Sony premium audio system, heated side mirrors with memory and remote start system. This may be a nice option if you live in a colder climate or park your truck outside at night. This option is also mandatory if you want the Navigation option below. Navigation system with other cool features such as DVD when parked and integrated stereo. Note: it requires Raptor Luxury package mentioned above. Includes rear view camera and integrated trailer brake controller. If you do not choose Navigation package below, then the camera view will display on the rear view mirror, instead of on the screen. This is obviously a good option if you plan on towing. You'll have more control, since you will be able to see the boat or trailer or whatever you are backing up to. Some people like a moonroof, others find it annoying. Your choice. We offer no opinion. Your color options are: Blue, Black, silver, White, and Molten Orange. You can also pay more for hood graphics, exterior graphics, access colors, etc. In addition, you can add a tailgate step and stowable bed extention. We don't find these options necessary for off-roading or appropriate for a Raptor and are therefore not mentioned here. Conclusion: If you are on a budget and don't want to spend too much money on this toy get the basic. 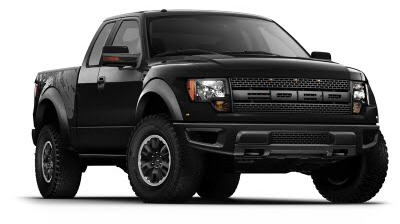 It has all the Raptor off-road capabilities and the luxury feeling. If you want additional options, we would add them in the following order: Raptor Luxury package, Navigation system, Raptor plus package, and then moonroof. Are you thinking about ordering the Ford Raptor? Here is your quick and easy guide to picking the right Raptor for you. Watch how Ford makes the F-150 in 18 hours! Enjoy this south of the border commercial for the very cool Ford F-150 Raptor!